Morocco is going ahead with its investment in clean energy, wind to be exact. Joint project between Moroccan Nateva Holding and France’s GDF Suez. The country has invested $685 million in the Tarfaya project that began in early 2013 and will be operational starting in October. 88 turbines out of a total planned of 131 have been built, producing up to 300 mega watts at full capacity. The wind farm is part of a plan that aims to have 42% of the country’s energy consumption coming from renewable energy by 2020. The Aircelle plant makes large components for planes. Morocco’s aviation industry has taken off and spread its wings. Nassima Boukhriss has never set foot on an airplane, but soon she will be helping wire up some of the world’s most advanced jetliners. The 22-year-old vocational student is participating in one of North Africa’s most ambitious economic-development efforts: starting an aerospace industry. Across Morocco, millions of people lack jobs, basic education and even running water. Manufacturing remains a small part of the economy compared with agriculture and tourism. Low-skilled textile work is one of the biggest sectors. 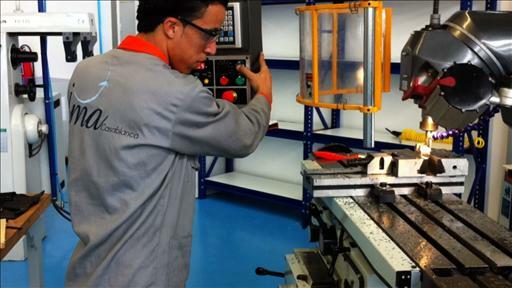 At a school near Casablanca, students are learning skills that they hope will win them high-paying jobs in Morocco’s growing aerospace industry. Yet over the past decade, Boeing Co.,Safran SA of France and other leading aviation companies have built increasingly sophisticated factories in this kingdom. 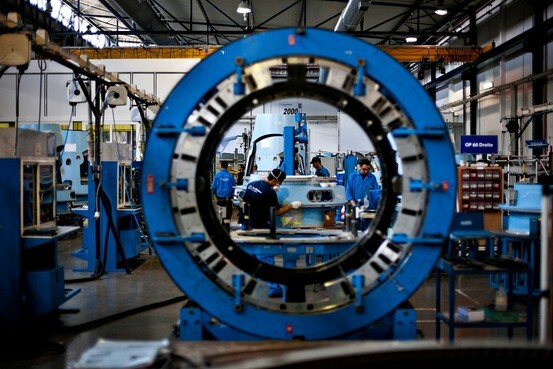 As revolutions swept neighboring countries last year, aerospace giantsUnited Technologies Corp. andBombardier Inc. unveiled investments of more than $200 million in new Moroccan factories. To ensure they have qualified staff, the government and an industry group in May opened the Moroccan Aerospace Institute, or IMA, the vocational school Ms. Boukhriss attends. The result is that the aviation industry now employs almost 10,000 Moroccans who earn about 15% above the country’s average monthly wage of roughly $320. Moroccan officials are betting that by leapfrogging into advanced manufacturing like aerospace and electronics, the country can attract more basic industries in their wake. Over the past decade, leading aviation companies have built increasingly sophisticated factories in Morocco, as local officials hope this push into advanced manufacturing can attract more basic industries in its wake. Workers at Le Piston Francais. The French aerospace component producer was one of the first contractors to arrive in Morocco. “When you succeed in aerospace, you can succeed in other industries,” said Hamid Benbrahim El-Andaloussi, president of Morocco’s aerospace trade group, Gimas. That hasn’t happened yet. Manufacturing’s share of Morocco’s economy has shrunk over the past decade. The country has joblessness of roughly 30% among both young and well-educated people—the same groups that helped lead revolts in Egypt and Tunisia. The upheaval of the Arab Spring has put new urgency on showing Morocco’s aerospace gambit can deliver. King Mohammed VI last March neutralized protests by offering a more democratic constitution and fresh elections, which proceeded peacefully in November. But for Morocco to remain calm, analysts say, it must create jobs. “High unemployment is at the center of what’s going on in the region,” says Karim Belayachi, a private-sector development specialist at the World Bank. 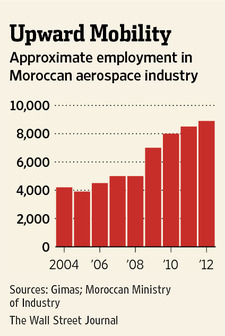 Morocco’s push into commercial aeronautics is unusual among developing economies. Brazil, Indonesia and South Africa in the last century developed military aerospace companies, but only Brazil’s privatized Empresa Brasileira de Aeronáutica SA successfully shifted to building passenger planes. Today, it is a national bellwether. Mexico has recently drawn aerospace component producers, but they remain a small part of its economy. Many more countries have expanded with technology and automotive investments, as Morocco is also attempting. Taiwan, South Korea and Slovakia relied on foreign or state-supported investments, mixed with entrepreneurialism, for economic growth. But those countries fostered regulatory climates more friendly to start-ups than Morocco has achieved and could tap skilled work forces. Education in Morocco lags behind its economic peers, according to the World Bank. Morocco’s aerospace development started in 1999 with a nudge from Mr. Benbrahim at Gimas, who was then a senior executive at Boeing’s longtime customer Royal Air Maroc. He and other officials at the national carrier urged the U.S. giant to invest in Morocco as a sign of good faith. “There was push-back within Boeing,” among executives who deemed an investment unnecessary, recalls Seddik Belyamani, who was then Boeing’s top airplane salesman and was born in Morocco. But the Moroccan links and a desire to fend off rival Airbus prevailed. Boeing, the airline and French electrical-wiring company Labinal SA in 2001 opened a small operation preparing cables for Boeing 737 jetliners, named Matis. Staff painstakingly prepared wire bundles and shipped them to Boeing plants in the U.S. for installation. The labor-intensive work entailed no technical background, yet Boeing managers still initially expected to achieve efficiency of only 30% of industry norms. To their surprise, staff hit 70% efficiency within two years, recalls Mr. Belyamani, who retired from Boeing in 2002 and recently was appointed chairman of Matis. The results impressed executives at Labinal, which in 2000 had been acquired by the French aerospace group now called Safran. Managers saw that as Matis grew, job openings attracted floods of highly educated applicants. More than 80% are women, who have limited job opportunities in traditional industries. The only foreigner among 700 Matis staff today is the French general manager, Sébastien Jaulerry, who previously worked for Labinal in the U.S. and France. Walking through the spotless plant recently, he said employees achieve “exactly the same standard” of quality as at his previous plants. Around him, Matis staff prepared wires not just for Boeing but also for General ElectricCo. engines, Dassault Aviation SA business jets and even Airbus jetliners. The most visible difference from more established aviation shops was the large number of women in head scarves. Safran, encouraged by results at Matis, expanded into more advanced manufacturing. In 2006, its Aircelle division opened a plant making jet-engine housings. The work, which includes machining advanced plastic composites and assembling safety-critical structures, mirrors operations at Aircelle plants in France and Britain. Product quality is also comparable, say Aircelle executives. Today, Moroccan officials highlight aerospace as a success within the country’s larger economic modernization drive, dubbed “Emergence.” Other projects include a giant Mediterranean port complex and tax-free zone at Tangiers, where French car giantRenault SA recently opened a big factory. Yet despite Morocco’s big push to create export-oriented jobs, manufacturing’s share of the economy is shrinking, says Lahcen Achy, an economist with the Carnegie Endowment for International Peace, in Morocco’s capital, Rabat. He calculates manufacturing now stands at roughly 15.6% of gross domestic product. The World Bank pegged it at 19% of GDP in 1995. Moroccan manufacturing growth hasn’t kept pace with tourism and other service businesses. A major reason, economists say, is the headaches that domestic entrepreneurs face. Mr. Belayachi at the World Bank notes that Morocco’s judicial system reports to the royal palace and isn’t an independent arm of government, which undermines its reliability. “Enforcing a contract is lengthy and difficult, which has a big impact” on small businesses, he said. Moroccan officials say they have made other efforts to help business, including recent anticorruption legislation and the creation in 2009 of a Central Authority for Corruption Prevention. Analysts say that as a result of impediments to business, local entrepreneurs haven’t piggybacked foreign investors as extensively as domestic producers in developing countries of Asia and Eastern Europe. Ahmed Chami, a member of parliament who served as Morocco’s minister of industry until recently, said foreign investments are starting to bear fruit and “spillover will happen.” The lack of local aerospace businesses is “the weakness in the picture today and should be the next focus,” he conceded. Boosters of Moroccan aerospace say the growing number of foreign suppliers indicates the sector will go local. One of the first contractors to arrive was Le Piston Français, an aerospace component producer based in Toulouse, France, near the Airbus unit of European Aeronautic Defence & Space Co. Director Vincent Fontaine says the company was drawn to Casablanca in 1999 by sales opportunities and government incentives, such as tax breaks. The plant has grown to 110 employees from about 25 and is adding new customers, such as Bombardier, Mr. Fontaine said. Aerospace materials, like advanced alloys, are also getting easier to buy locally, marking “a big step for industrial development,” he said. But other investors have faced a bumpier ride. Baccarat Precision, a French family-owned aerospace contractor, started making pistons for jetliner brakes near Casablanca in 2007. Soon after, it landed a giant order for explosive devices that blow open airplane doors in emergency evacuations. The complex cylinders, made of 40 precisely machined elements, must be assembled in a clean room to keep pressurized nitrogen from escaping. When production began in 2008, managers rejected every second cylinder due to production flaws. “Machinists in Morocco have never seen pieces like this,” said local manager Giancarlo Zanfonato, holding one of the hand-size metal devices. He eventually realized that compared with seasoned French workers, his Moroccan staff needed twice the documentation, including pictures detailing every production step. After intense efforts to educate machinists, the rejection rate has shrunk below 10%, yet remains far above the target of 2%, Mr. Zanfonato said. The project, which was expected to break even within one year, remains unprofitable. “We are a small company and this project was much too ambitious for us,” he said. Mr. Zanfonato sees a hopeful sign in the creation of IMA, the vocational school, which will graduate several hundred students annually. The center is a partnership between the government, which contributed the land and buildings, and the industry group, Gimas. Its members organize and sponsor training, modeled on French standards, for their new hires. Students spend up to 10 months alternating two-week stints at IMA, where many live in dormitories, and on their new jobs. Demand for graduates is so strong that companies are pressing for two shifts of classes, said IMA Director Annie Lagrandeur recently, as students practiced wiring and machining in the school’s shop. Nearby, others attended lectures given by veteran aerospace workers whom IMA hired from local plants for their expertise. Before IMA, foreign aerospace investors were paranoid about rivals poaching their few skilled employees, Ms. Lagrandeur recalled. Some companies even forbade their local staff from riding together on shuttle buses out of fear they might try to recruit each other. Within three months of IMA’s opening in May, roughly 1,200 aspiring students had delivered resumes to the front gate, and more sent in applications, said Ms. Lagrandeur. “It’s a great opportunity because we learn very technical skills in electronics,” said Ms. Boukhriss, the student. Classmate Said Ouchen added he is proud Morocco is developing an aerospace sector and has remained stable over the past year. “Morocco is an example,” he said. Africa needs more manufacturing. Morocco should be applauded for crafting such an industrial policy. Not only is the policy attracting foreign investment, workers locally are being trained and gaining valuable experience in the highly skilled profession of aerospace. Lockheed Martin has delivered its first pair of F-16’s to the Royal Moroccan Air Force (RMAF). The Royal Moroccan Air Force (RMAF) unveiled the first four of 24 Lockheed Martin F-16 aircraft in a ceremony at Ben Guerrir Air Base in Morocco. Senior representatives from the Moroccan and U.S.governments and air forces were present for the historic event. This is Morocco’s first experience with the F-16 so the package being provided by the U.S. government is comprehensive. Morocco will acquire a Block 52 configuration of the F-16C/D aircraft tailored to meet the specific requirements of the RMAF. The sale includes the aircraft, mission equipment and a support package provided by Lockheed Martin and other U.S. and international contractors. The new aircraft will supplement the RMAF’s existing fleet of fighter aircraft and will contribute to the upgrade and modernization of the RMAF. 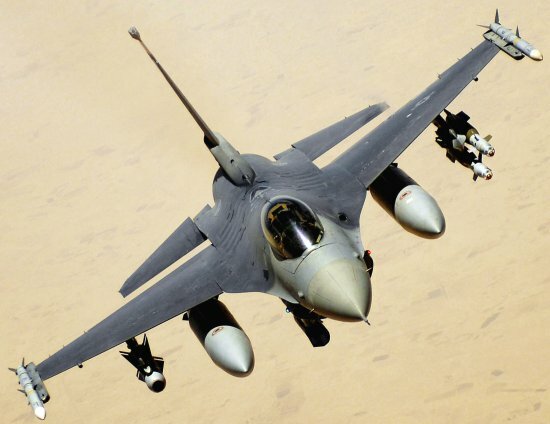 “The delivery of these aircraft places Morocco among the very elite group of air forces of the world who operate the advanced multirole F-16,” said Ralph D. Heath, executive vice president of Lockheed Martin’s Aeronautics business area. The F-16 is the choice of 25 nations. More than 4,400 aircraft have been delivered worldwide from assembly lines in five countries. The F-16 program has been characterized by unprecedented international cooperation among governments, air forces and aerospace industries. Major upgrades to all F-16 versions are being incorporated to keep the fleet modern and fully supportable over the aircraft’s long service life. The F-16 was designed as a highly maneuvarable, reliable and lower cost alternative to the very expensive and complex but capable F-15 and Mig 29. Here is a promotional video of the F-16 by Lockheed Martin. 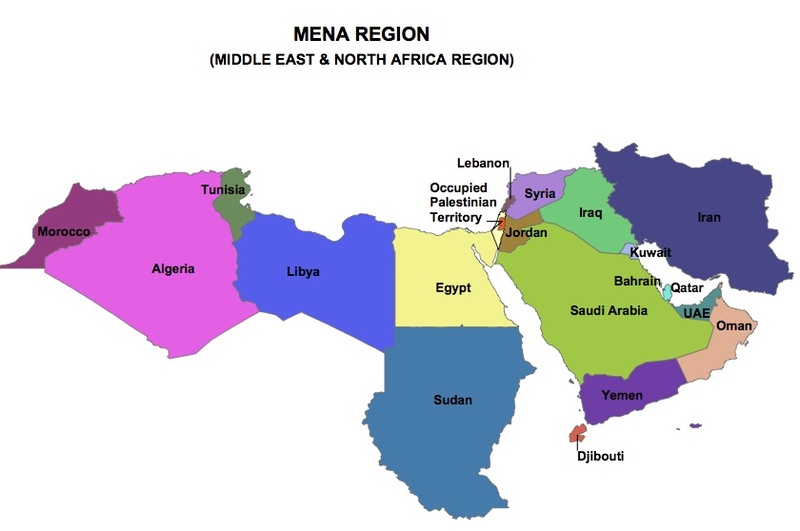 Though this is part of Morocco’s arms build up, it is also strategic. This investment and purchase of US military equipment is a continuation of relations between Morocco and the U.S.. This past June military exercise Africa Lion took place, Morocco participated in the NATO no-fly-zone over Libya and trade is increasing between both sides. The U.S. and Morocco have had a long and historic relationship. The Kingdom of Morocco was among the first outside powers to recognize America as a state. In fact, the 1787 Treaty of Peace and Friendship is the longest-standing U.S. treaty still in force today. Expect good relations between both nations to continue. 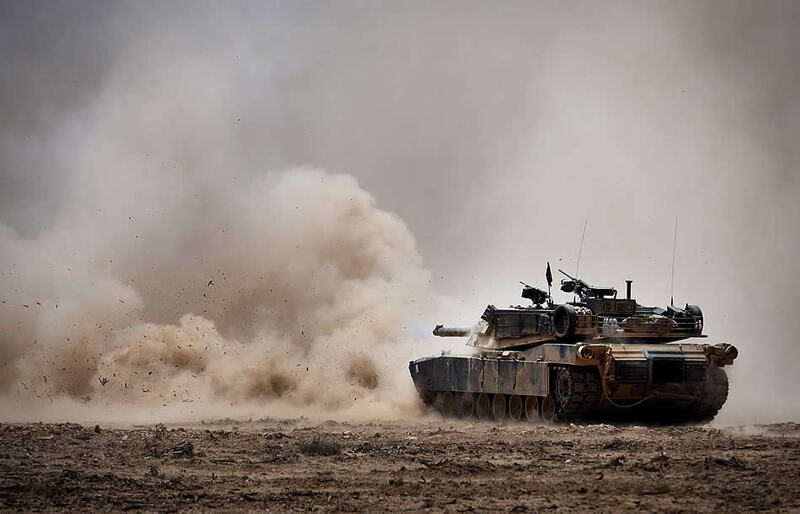 An M1A1 Abrams Main Battle Tank from Company E, 4th Tank Battalion, 4th Marine Division, fires a round down range from its 120mm main gun during a training mission here May 22 as part of African Lion 2011. African Lion is an annually scheduled, bilateral exercise between the Kingdom of Morocco and the U.S. that involves more than 2,000 U.S. service members and approximately 900 members of the Royal Moroccan Armed Forces. African Lion is an annually scheduled, bilateral U.S.-Moroccan exercise designed to promote interoperability and mutual understanding of each nation’s military tactics, techniques and procedures. Clip below is about the Marine convoy from Agadir to Tan-Tan, Morocco. This is the aviation refueling portion of the exercise with the Royal Moroccan Armed Forces and Marine Aerial Refueler Transport Squadron 234 refueling exercise between a U.S. C-130 Hercules and a Moroccan aircraft. Two way trade between the U.S. and Morocco has doubled since 2006. That year Morocco and the US entered into a Free Trade Agreement and bilateral trade between the two countries has since doubled, reaching $2.6 billion last year. More and more US companies are taking advantage of the growing economic opportunities thanks to the FTA (Free Trade Agreement) with Morocco the only African country that has an FTA with the US. a delegation of US corporate leaders traveled to Morocco to explore the rapidly growing business and investment opportunities it has to offer across a variety of sectors. Representatives from nearly 20 US companies, including Lockheed Martin, Cisco Systems, FedEx, Raytheon, Motorola Solutions, and General Dynamics IT, met with private sector leaders and top Moroccan government officials at a time of tremendous bilateral growth between the US and Morocco, a key hub for accessing markets in Europe, Africa, and the Middle East…………….At the conclusion of the delegation’s visit to Morocco, LaMar Willis, General Dynamics IT VP of Strategic Program Development commented, “I think that the Moroccan government here is very progressive. Logistics-wise, Morocco is very strategically located—with good sea ports, airport infrastructure, and road investment. I think Morocco presents good opportunities and I would encourage US businesses to consider it. There is a very clear indication from the Moroccan government that they want US businesses and are willing to work with us.”……………………….Earlier this month, Bridgestone Corporation, the world’s largest tire and rubber company, opened a new tire sales facility in Casablanca, Morocco. Bridgestone, which “aims to further strengthen its business in Morocco’s highly promising market,” called Morocco “a key region in which rapid economic expansion can be anticipated.”……….. Nothing cements a relationship between two countries quite like trade and economics. 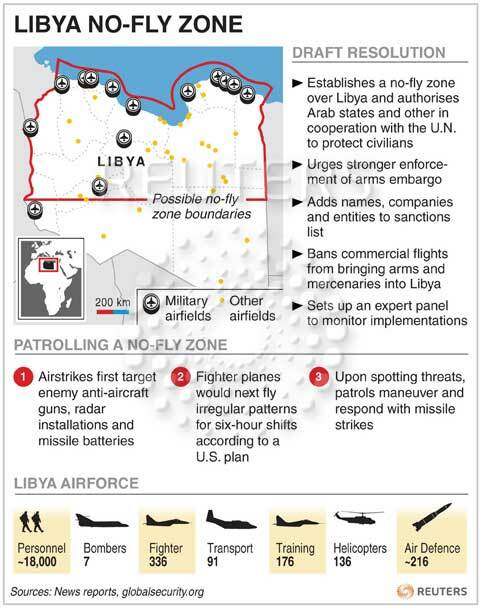 This is a clear example of that and shows the need for other African nations to seek trade agreements with the U.S.
Canada, Denmark, Spain and several Arab states have joined the campaign to enforce the no-fly-zone over Libya. Canadian warplanes committed to a Western coalition air campaign over Libya will be enforcing a no-fly zone within 48 hours, Defence Minister Peter MacKay said Sunday. Six CF-18s left CFB Bagotville in Quebec on Friday to join the Western air coalition to enforce a UN no-fly zone over Libya. The announcement comes a day after U.S. and European airstrikes began on Libyan ruler Moammar Gadhafi’s forces and air defences to halt their bloody crackdown on rebels in the country’s east. The CF-18s from CFB Bagotville, along with 150 personnel, arrived at a small airbase in Trapani, Sicily, around noon local time Saturday. The military had been considering moving the aircraft to a larger base in France, but defence sources said the jets are staying in Italy, the CBC’s James Cudmore reported on Sunday. The sources said the Canadian pilots will start flying missions to enforce the no-fly zones once the military has approved systems for rules of engagement, command and control, as well as identifying friendly or hostile forces, Cudmore reported. 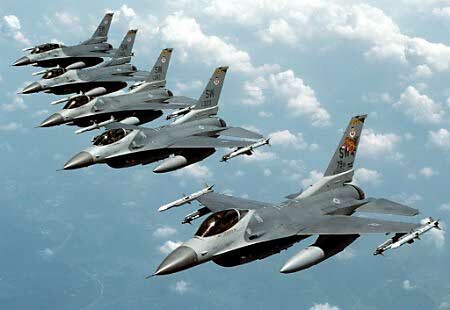 Denmark has six F-16 fighter ready to take off from Italy’s Sigonella air base to join the international air campaign against Muamer Gaddafi’s forces in Libya, ANSA quoted a senior Italian military official as saying Sunday. Rocco Massimo Zafarana said the Danish aircraft arrived Saturday at the base in Sicily, which is being used to support Operation “Odyssey Dawn” launched to protect Libyan civilians under a mandate of the UN Security Council. “We do not know if other aircraft will arrive from other countries, but we are ready to welcome them and to provide them with all the necessary support,” Zafarana added. Italy's Prime Minister Silvio Berlusconi and Defence Minister Ignazio La Russa attend an extraordinary meeting for the Libyan crisis in Rome. “for now” but did not rule out a bigger participation later. He also said that eight jets are available to join the coalition. The Spanish Defense Ministry said on Saturday that the country has sent four F-18 fighter jets and a refueling aircraft to Italy to take part in the operation over Libya starting on Sunday, AFP reported. “These planes will carry out patrol missions and will be operational from tomorrow (Sunday),” a statement issued by the Spanish Defense Ministry read. Qatar‘s Prime Minister Sheikh Hamad Bin Jasim Al Thani said the emirate will join the U.S., U.K., Canada, France and Italy against Libya, making it the first Arab country to commit military forces. Here is a video report about the military assets being used in Operation Odyssey Dawn.